The Sheffield Teaching Hospitals Virology Department is the first site to introduce Beckman Coulter’s DxN VERIS HBV assay* routinely. Operating on the DxN VERIS Molecular Diagnostics System, that consolidates DNA extraction, amplification and detection within a single automated instrument, the HBV assay will allow the laboratory to offer service users greater precision at low HBV viral loads as well as improved turnaround times. “For samples received from other hospitals, this could mean a saving of several days, which can affect patient call back”, said Duncan Whittaker, Laboratory Manager Virology. “An earlier appointment means faster intervention and improved patient management. In the future, it is intended to obtain feedback from service users about the significance of these service improvements to patients; whether they have changed the way in which patients are managed and if they have allowed any changes in ward or clinic practice. “Initial comments from the renal transplant department have been that faster results for certain viral load assays could be life-saving in some instances. In addition, the renal dialysis team could see the benefit of faster results, in particular for dialysis patients returning from abroad. Whereas currently these patients need to attend two hospital visits to confirm a negative status, the DxN VERIS could reduce this to one visit, which is an immediate benefit for patients who have to travel some distance to the hospital. “The DxN VERIS is the kind of instrumentation that will help the laboratory to meet long term goals for improved services, with faster turnaround times and greater productivity without the need to increase staffing levels”, Whittaker concluded. 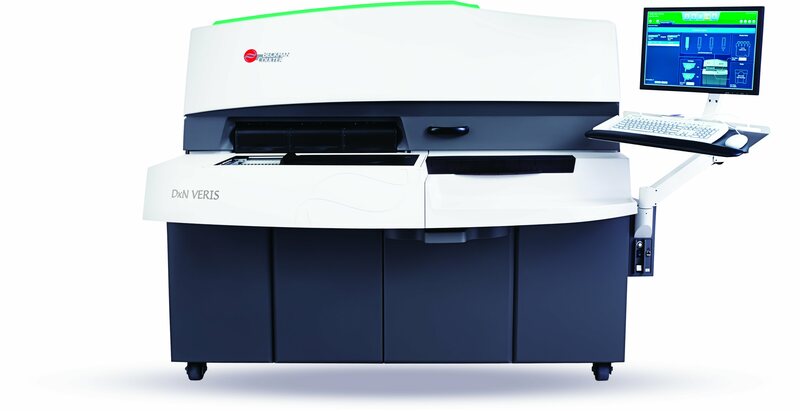 By reducing manual intervention, and automating the steps from sample loading to reporting of results, the DxN VERIS system has the potential to revolutionise laboratory workflows and reduce time to results. There is no lengthy set-up – all consumables/reagents are refrigerated on-board: HBV, HCV, HIV-1 and CMV viral load assays* are currently available; these will be followed by assays for STDs/women’s health and Hospital Acquired Infections.